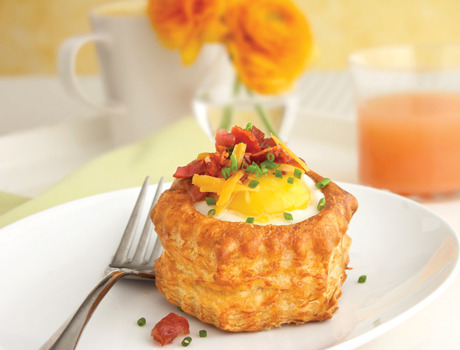 Heres an easy, yet elegant breakfast or brunch idea thats sure to impress. 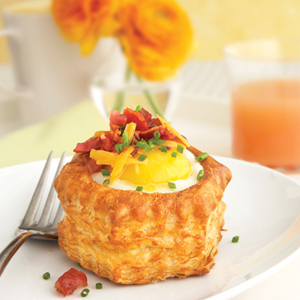 Eggs are baked in puff pastry shells and then garnished with bacon, cheese and fresh chives. Its a winning combination thats guaranteed to please! Place the pastry shells onto a baking sheet. Crack 1 egg into each pastry shell. Bake for 15 minutes or until the eggs are set. Top each pastry with 1 teaspoon cheese, 1 tablespoon bacon and 1/2 teaspoon chives. Always bake Puff Pastry Shells in a preheated 425° F oven. Do not bake Shells in a microwave or a toaster oven. Place Puff Pastry Shells on ungreased baking sheets with “top” facing up. Place Shells about 2 inches apart on baking sheet. To recrisp Puff Pastry shells, place them in a 400° F oven for 5 minutes. Unfilled baked Puff Pastry Shells may be stored in an airtight container at room temperature for up to 2 days.